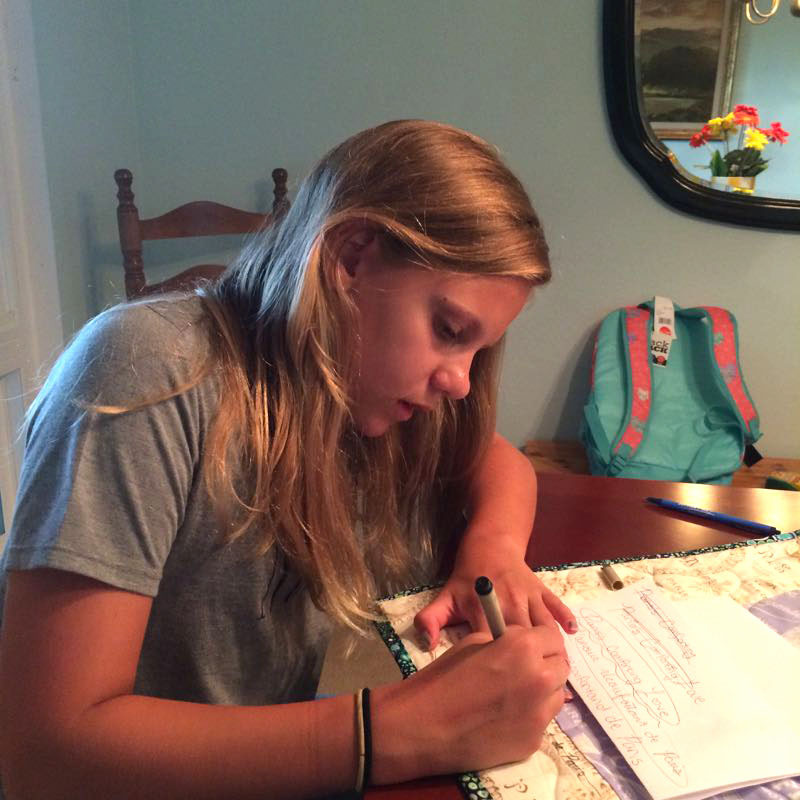 Posted on August 16, 2016 by Elizabeth E.
Keagan, my first grandchild, came to visit me last month (along with her Mom–our daughter– and family. She’s crazy about Paris and France and all things French, so I collected a few fabrics before she got there and surprised her with them. 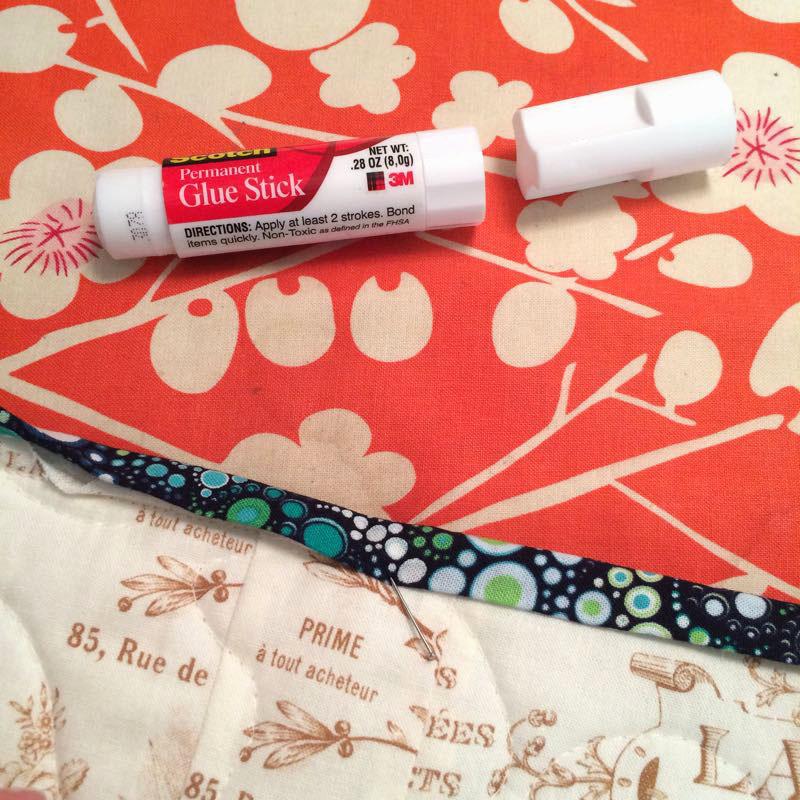 And you just can’t leave it at that in a quilter’s house. L’Amour recoufortand de Paris, the title, means Paris’ Comforting Love, because she considered how quilts give comfort and since it had all things Paris in it, she thought it up and had my husband translate it for her. We got all the pieces cut out, then I had to go and Take Care of Things, and when I came back, this was the design she’d carefully put together on the design wall. We sewed the pieces together–me on my regular machine, and she beside me on the Featherweight– and we put the top together. Her brother Riley helped iron the blocks; it was a team working together. I stitched most of it on the Sweet Sixteen machine, but had her take a turn at the quilting, so she could say she’d help quilt it, too. Since we were working against a deadline, we used a glue stick to tack down the binding, and then I top-stitched it into place. And then, just like that! it was time to head on home. Here they are Sunday morning, all the kids (Keagan and Riley and Maddy) lined up for a picture before they piled in their van to drive home. Such a sweet story and she did so well!!! I kept hoping my 2 granddaughters “got the sewing gene”, but, alas, not to be. All efforts to get them interested have petered out, but I hold out hope that someday….. You’re a good grandma and we KNOW you’re a great teacher!!!! 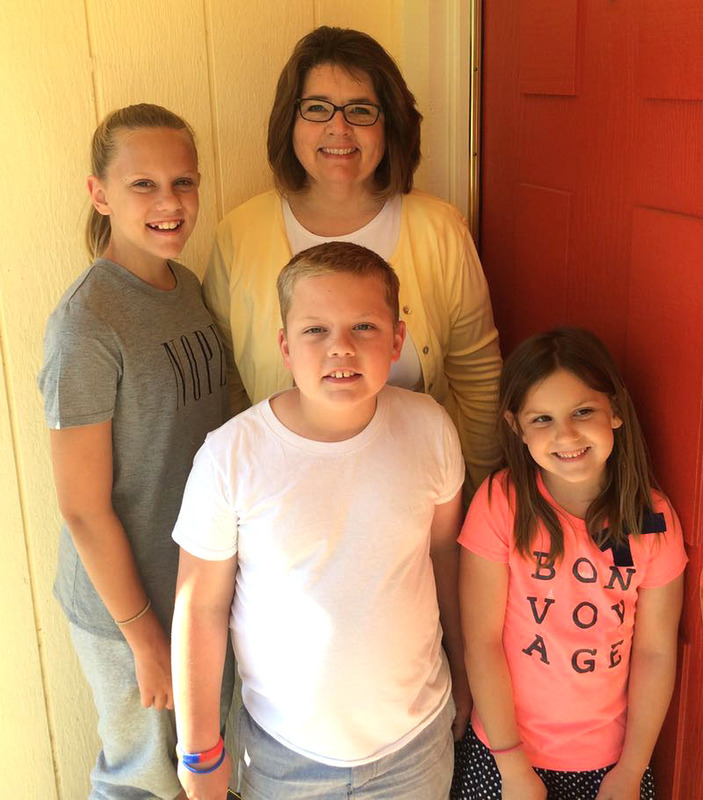 I love seeing your sweet family! The quilt is lovely and it will be a cherished part of her life. Thanks for sharing, Elizabeth! You are the most awesome grandma around!!! Awesome you both should be so proud! “What they said”!!! My daughter’s definitely missed that desire to sew (even a button!). I’m hoping that gene landed in my 2 granddaughters. Great story to start my day! 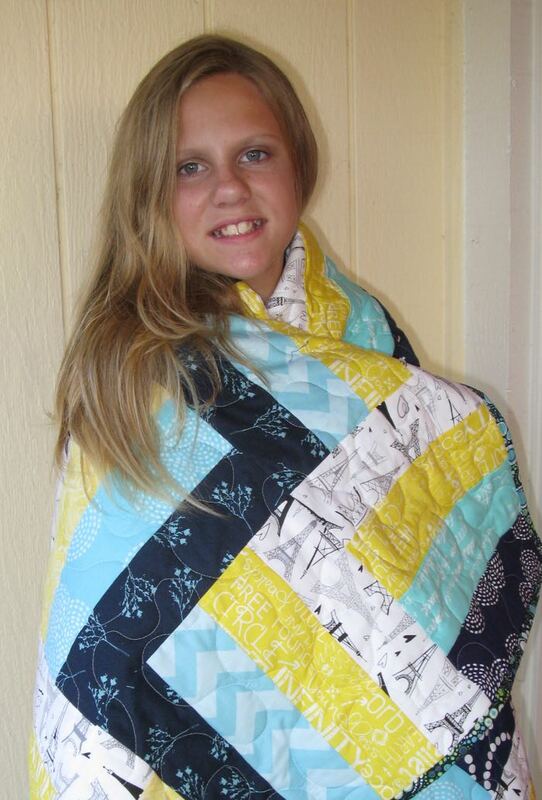 Pretty girl,pretty quilt. 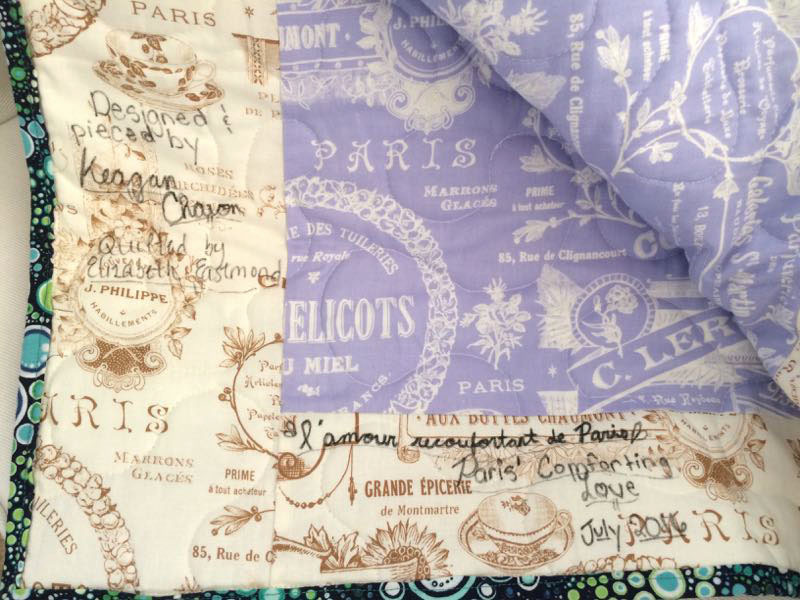 It’s amazing how much ‘Paris’ fabric is available right now.i have even seen some Eiffel Tower fabric in Walmart! I love that she designed the layout while you were away!! Nice way to share something you love to do with someone you love. You are passing on the legacy. Perfect follow up to the story about your Mom and her quilt. Not only does she have a beautiful quilt to wrap around her, but she will have such precious memories each and every time she does so. She (and you) did a great job on it. Looks like another quilter in the making. How fun! I can’t believe that Keagan is that old! I remember when Barbara brought her by the lab when she was a baby and Dave kept saying, “Isn’t she the most beautiful baby.” and then taking off to show her to everyone. 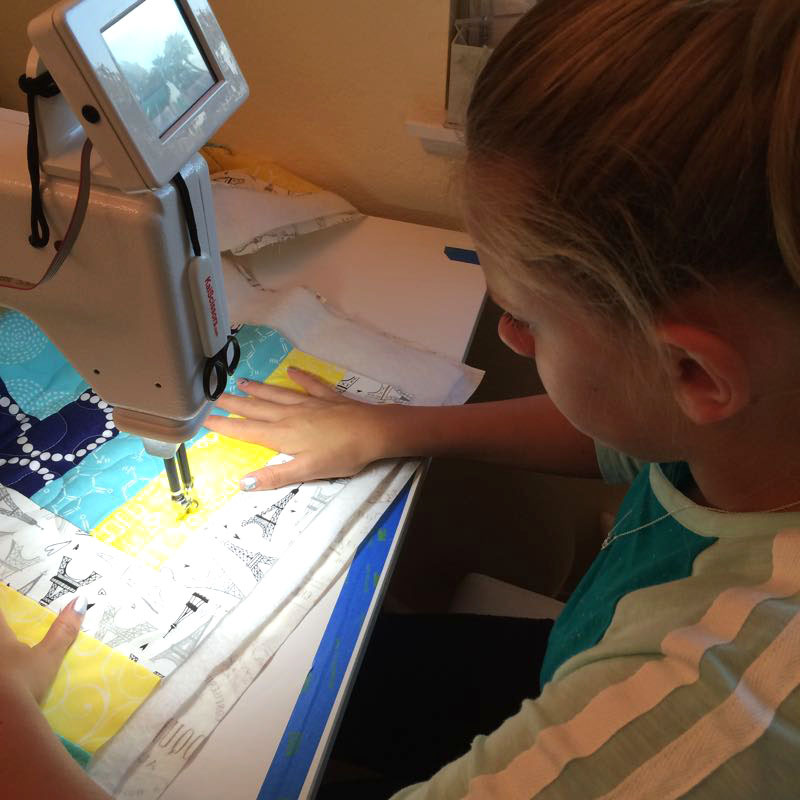 Now she’s designing and making quilts. How time flies by especially as one gets older – it seems to approach light speed. Keagan looks very happy with her achievement! 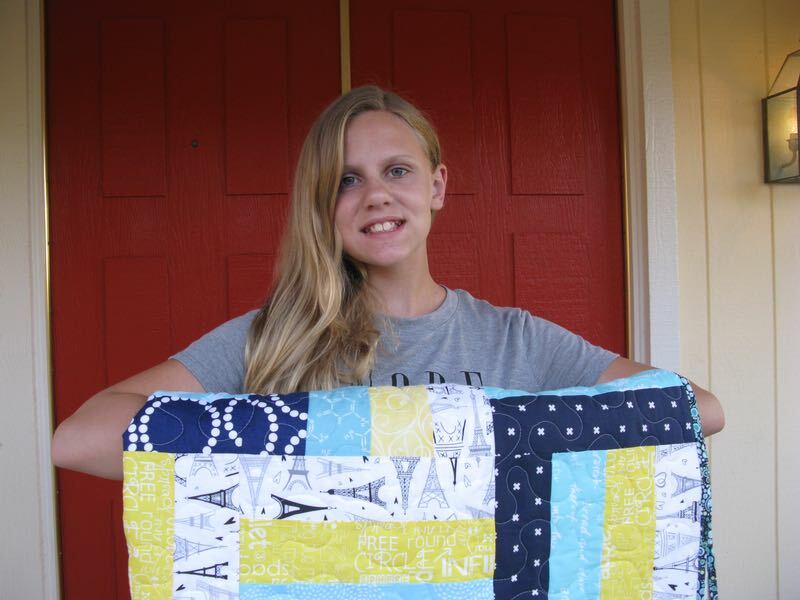 And what special memories it will hold for her as she begins her quilting journey! I was binding with that chevron print yesterday. As Anne said, this is a great postscript to your Legacy post. This is your legacy Elizabeth. Yay on quilting with kids! Those kids are pretty cute, too! 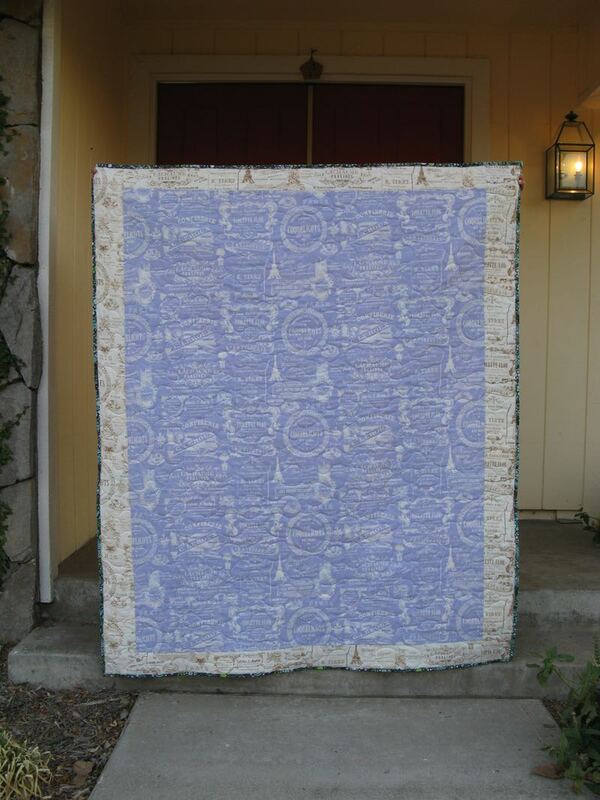 Working with your grandma to make your own quilt is ever so much better than just being given a quilt! This is a memory she will treasure. 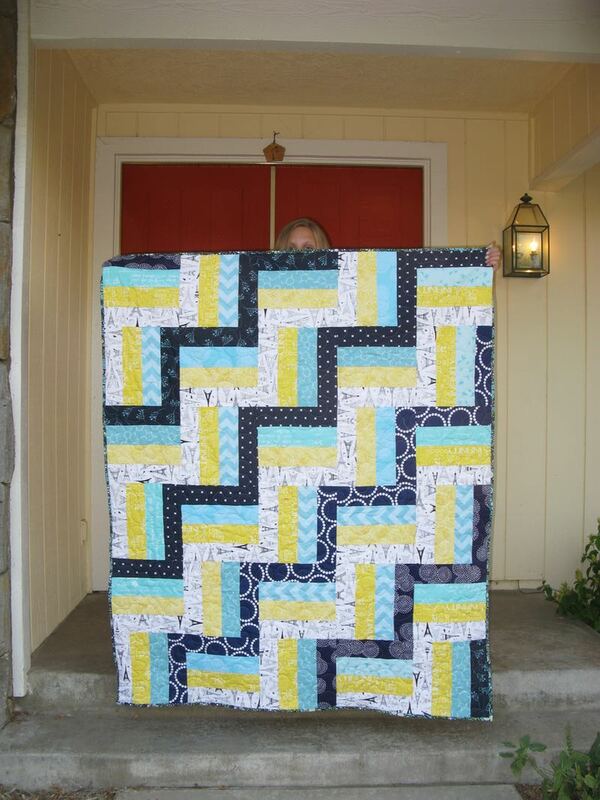 Pingback: Riley’s Quilt | OccasionalPiece--Quilt!